NARS is one of the brands that has major lust-factor for me. There is something about the sleek black packaging that manages to call out to me season after season, whatever the colours. The Spring collection is no different. 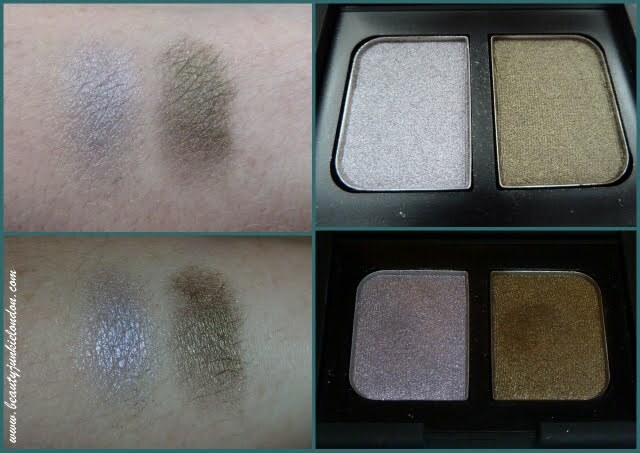 Normally I gravitate towards natural colours but these are beautiful muted tones with a pretty shimmer. Top-Natural Light. Bottom -Artificial Light. Lilac & Khaki Greens are not the most natural combination but somehow they work – because the lilac is a bit murkier rather than the traditional ‘pretty’ lilac they have a bit of an edge to them rather than the typical spring pastels. These are really easy to wear colours – perfect if you are a bit scared of colour but want to branch out from greys/browns. I used the lilac shade across the lid and the khaki green to add definition & depth. The shadows are beautifully smooth & blend like a dream. There’s no denying that £23.50 for an eyeshadow duo isn’t cheap, but they are really good quality & a there is a decent amount of product. If you want to see the rest of the Nars Spring 2011 Collection then head over to the Nars website. But warning, I can’t be held responsible for any expensive cravings that happen as a result…! Interested to see that you find these smooth and blendable. I’m finding the lilac in particular almost impossible to get any colour payoff from at all. I could be wearing any kind of sheer grey. My lids look a little darker (minimally so) but that’s it, however much I pack on, with or without primer. Similarly, the khaki over the lilac just looks a bit darker still but still no clear colour of any sort. I haven’t tried the khaki by itself yet. I’ve heard from other bloggers that they haven’t been impressed with the colour pay off too. But I’ve found them to be fine – although the lilac shade is quite subtle on the eye. I think it’s probably my personal preference of subtle colours that means this is fine with me. I do love the green but wouldn’t be surprised if there are similar shades out there too!